Early summer is a time of new life around Lake Wicwas. 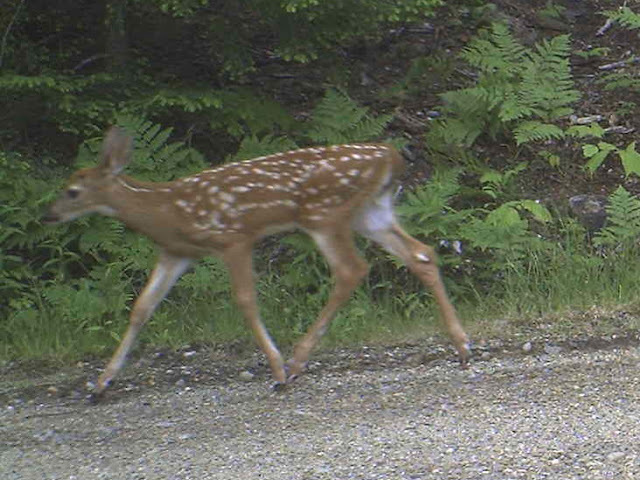 Many of our local inhabitants are either already raising their young or preparing for their imminent arrival - I just learned that someone on the lake saw a tiny, spindly-legged fawn, probably only a day or two old. I hope I'll get to see it too (this picture is from two years ago). The loons have selected a nesting site for the year - you won't be able to miss it if you are out on the lake as it's on an island right in the middle of the lake and the Loon Preservation Committee has marked it clearly with signs and a buoy line. Like any house, it's all about location, and there's always a tradeoff. This site far from the main land is well protected from predators, but is more susceptible to boat wakes and human activity. The lake level has been quite stable this spring, which is good news for loon nesting - if we are careful with our lake activities we should have new loon chicks in late June or early July. Other water fowl have an earlier schedule. I have seen both duck chicks and Canada Goose chicks on the lake. The later are already quite good size. Look at those tiny wings! Have you ever seen bare green stalks sticking up out of the water? Pickerel-weed that have had their arrowheads removed? Well, here's evidence of one of the culprits. Smaller birds are also actively caring for their young. I have seen the chick-a-dees plucking nice juicy green worms off the leaves and bringing them into the bird house, and the phoebes are doing the same with insects. I heard loud raucous baby birds high up in a tree on one walk, and within seconds mother or father downy woodpecker was right there above me making a tremendous racket to distract me and draw me away from the nest. I looked for a moment to see if I could find the nest, but it was high up in the trees, well hidden, and mom or dad was so upset I went quickly on my way. I also continue to see lots of beaver activity all around the lake, including two recently enlarged lodges. Beaver birth their kits this time of year, so they have been preparing for a larger family. Up to a dozen beaver may live in one lodge, though when a family approaches this size they usually build a second home. Beavers have tight-knit families, with offspring less than two years old helping the parents feed the new kits as well as maintain the lodge, though soon after that age they are sent off to live on their own. I've never seen a tiny beaver, so perhaps they stay in the the lodge until they are rather large. Being so active I've had great opportunities to see them up close this spring. The population of Lake Wicwas is on the upswing - let's hope a new loon will be added to the neighborhood!